It took far longer than I would have liked, but today I am pleased to report that this blog is available through the Apple News app. All seventeen active Apple News users can now add The Digital Reader to their favorites list and stay abreast of the latest digital publishing news. I'm not showing up in the search yet, but you can follow this blog by clicking this link (it only works on your iDevice). If you have any questions, including about technical details, just ask in the comments. I've been exploring the features for the past few hours and so far everything looks pretty good, but I can't take any credit. I'm not sure why my blog looks better in Apple News than my competition, or Talking New Media, for example. I don't actually have very many options behind the scenes; I can set my logo and give Apple various RSS feeds for the categories, but everything else (including all the formatting) is handled automatically. I don't even have any traffic stats. A select few big name web publishers like TechCrunch and The Atlantic have extra options including custom formatting for posts, special branding, and adverts, but Apple isn't making those features available to the hoi polloi. 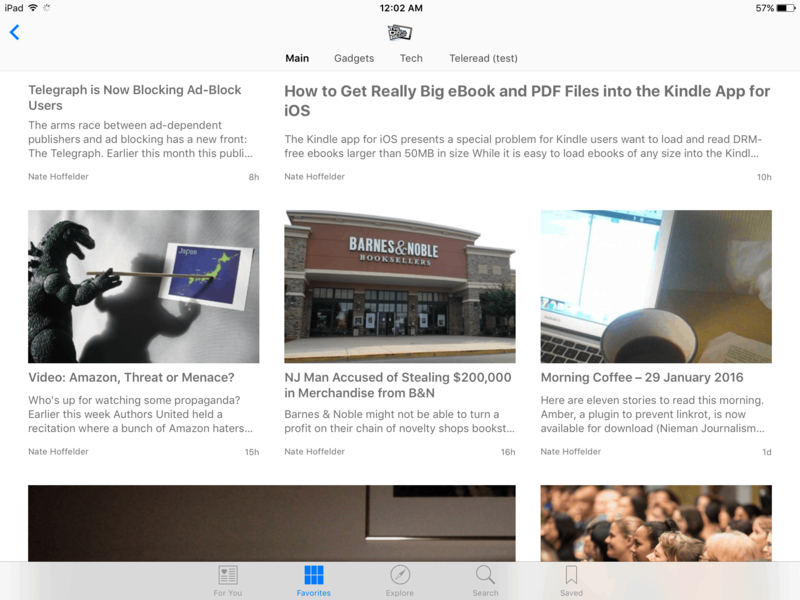 And most sites are cool with that; in fact, some of the blogs I follow, like Liliputing and Techdirt (to name a couple examples), aren't even in Apple News. Congrats Nate. I found it easily in iOS and signed up. Looks good, except, on my account when you click on it you go to the main page, which has all the articles listed. But when you click on the Tech, Gadgets and Morning Coffee sub titles it goes to a blank page that says “No Stories.” I don’t know if that’s an error, or it needs time to load those categories, but I thought I’d let you know. Whatever one thinks of Apple, and who knows where it is going with the News app, its major player so it’s great to have your site there! I don’t think those will be populated until I write something new. I just wanted to highlight that “The Digital Reader” has been in the Mosaiscope store for nearly 3 months now (since the day we launched). Mosaiscope is definitely the new-comer on the RSS news aggregation and reading scene, but one of the unique things we have is a store that links to all the great content that gets added to it (non-family friendly items excluded, of course). I’m the founder of the app & company, and a longtime fan of The Digital Reader (even when the name was different for a little while;), and personally subscribe to the RSS feed (thus it has been in the store since day 1). Apple is one hell of a company to go up against, and believe me when I tell you that I almost threw up when I watched their keynote last year when they, to everyone’s surprise I think, announced Apple News and we were already several months into development on Mosaiscope. I think we have a lot of unique items that set us apart so I’m better now, but definitely still have an eye on them. Keep up the great work Nate and I’ll probably email you directly, and maybe even tweet about this as well, and hopefully we’ll get a chance to talk soon. This site is one of my favorites. Congrats, Nate! I like the articles of you site. I’m not so happy about the formatting. It started out looking nice, but now it is getting a little ugly. Congratulations, Nate! You deserve it.